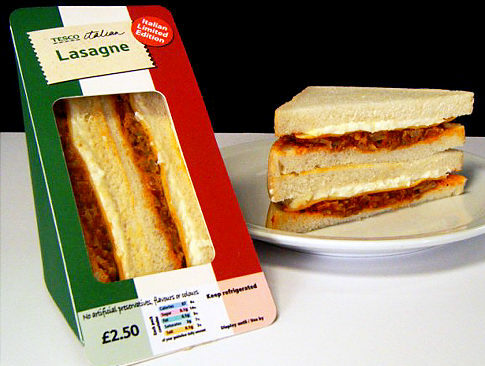 Last week, a lasagna sandwich in the U.K. made headlines here in the U.S. And it got me thinking…what other main course meals would make good — or at least potentially lucrative — sandwiches? – The Fried Chicken Sandwich: Lest this sound like the KFC Double Down, I’d like to point out that I’m thinking of this more like Thanksgiving leftovers. I love making turkey sandwiches the next day with a little mashed potato, stuffing, gravy and cranberry sauce. I’m sort of thinking of that chicken-mashed-potato-corn-bowl-thing KFC put out awhile back — something with all of those components, but in a grilled cheese sandwich. Although, then again, you might be able to get away without cheese on this one. – The Steak and Chimichurri Sandwich: Perhaps like a Philly cheesesteak, but with an Argentinian twist? – The Chicken Tikka Sandwich: Like Indian takeout, but between two slices of bread. (I guess I could perhaps suggest using naan, but I’m not sure how well that would grill up.) Perhaps a dab of yogurt on top and that potato-pea-chickpea mixture that comes in samosas, too? – The Fried Halibut Sandwich: I discovered fried halibut at the Alaska Salmon Bake in Fairbanks and was completely amazed by it. I’d always been ho-hum about fish and chips, but fried halibut is crazy-good. I think if you have some cole slaw and a little tartar sauce, you’d be all set. Tagged as Alaska, Alaska Salmon Bake, Argentina, bacon, carbohydrates, carbs, chicken tikka, cole slaw, cranberry sauce, entrees, Fairbanks, fish and chips, fried chicken, fried chicken sandwich, fried halibut, fried spaghetti, gravy, halibut, Indian takeout, KFC, KFC Double Down, lasagna, lasagna sandwich, macaroni and cheese, meatloaf, meatloaf sandwich, naan, samosa, steak and chimichurri, stuffing, taco, taco sandwich, tartar sauce, Tesco, Tesco food development, Thanksgiving, Thanksgiving leftovers, turkey, U.K.